This 4 Bedroom (1 is windowless (den)), 2 Bathroom suite is located in the DISCOVERY BAY RESORT. 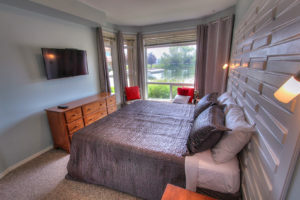 Benefiting from central Air Conditioning/Heating, this suite provides superior accommodations inside and beautiful views of the docked boats on the lagoon and across to the bird sanctuary and lake from the outside balcony. This newly renovated (May 2018) townhouse is situated close to the lagoon facing westerly for daily relaxing and people watching along the boardwalk. It is fully equipped with all that’s needed to accommodate up to 9 people (8 if you don’t want to have a guest on the living room sofa bed) with a Queen bed in each room. The 3rd and 4th bedroom are located on the second level(accessible by stairs) of the townhouse with the 3rd bathroom. There are 4 TV’s within the suite; master bedroom, living room, second and third bedrooms, includes basic cable service with high speed internet (Wi-Fi). 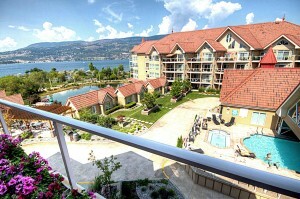 In suite laundry with full size washer & dryer and extra bed linen, towels, pool towels with gas BBQ on the deck. The master bedroom has an adjoining ensuite bathroom. Within the 2nd level building parkade you will find a reserved single car space located so conveniently close to the suite entry door, your groceries will almost fall into the fridge by themselves. It will take you 1 minute to get to the outdoor pool & hot tub or about 5 mins to walk to Tugboat beach (opposite) – pool towels provided! Unique two storey town home -looks directly out over the lagoon - with direct access off parkade, and to pool deck via second floor entry.